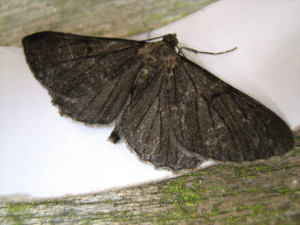 Observation - Melanistic Moth? - UK and Ireland. Description: Forewing approx 25mm. very dark fairly uniform colouring. always rested in this shape, wings widespread. Forewing approx 25mm. very dark fairly uniform colouring. always rested in this shape, wings widespread.